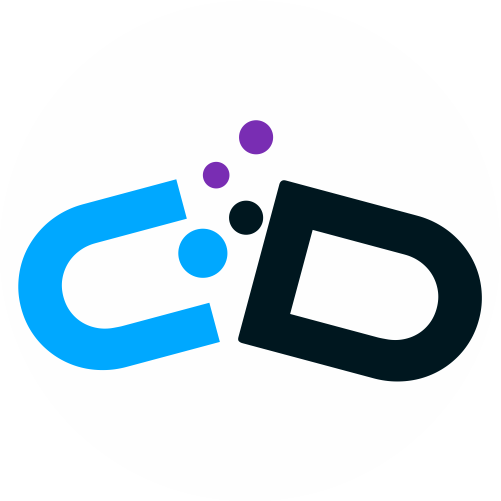 DNA or Deoxyribonucleic acid is a complex organic molecule that carries the genetic information of growth, development and reproduction of all living organisms. These are stored in every cell and passed down from the parents to children. DNA is made of nucleotides. 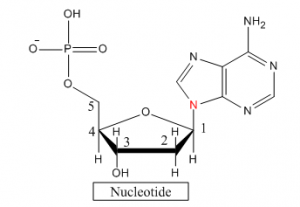 Nucleotides are composed of sugar group, phosphate group and a nitrogen base. The repeated unit of sugar and phosphate group is the backbone of DNA. From the abbreviation of DNA (Deoxyribonucleic acid) and RNA (Ribonucleic acid) we can get the name of sugar group. The first part of the name gives the sugar name as deoxyribose and ribose respectively. 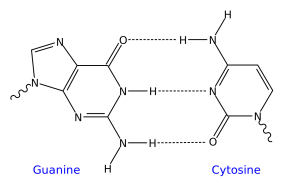 In deoxyribose, from the name we can say that one oxygen is less than ribose. The numbering of these sugars starts from the right carbon just next to cyclic oxygen and ends with the -CH2OH side group with number 5. The another repeated part of the DNA is a phosphate group. The phosphorous of the phosphate group is attached with the oxygen at 5th carbon of the sugar molecule. In DNA there are four nitrogen bases what are attached to the number one carbon of the sugar. 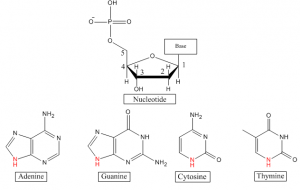 These bases are adenine (A), guanine (G), cytosine (C) and thymine (T). 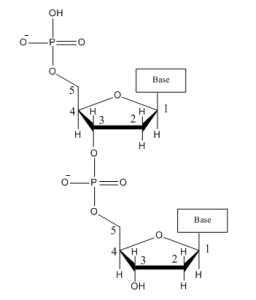 This is a condensation reaction as two molecules joined together with a loss of a small molecule (for this case- H2O). 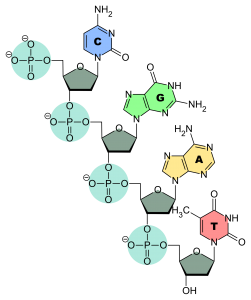 Two nucleotides can join together by P-O linkage. 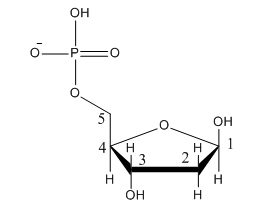 This is again a condensation reaction where oxygen atom at the 3rd carbon is joined with the oxygen atom of phosphate group of another nucleotide with the loss of H2O molecule. When the nucleotides bonded together repeatedly in the same way, a DNA chain is formed. In DNA chain the phosphate-sugar is the backbone. We are not interested about the backbone as it is same for each nucleotide. However nitrogen base is the most important part of DNA chain because the order of their sequence determines the DNA’s instruction or genetic code. Two DNA chains joined together with hydrogen bond. Always adenine (A) joins with thymine (T) and guanine (G) joins with cytosine (C). Here we can see that smaller nitrogen base (T and C) joins with always the bigger one (A and G). This is how it can keep the distance between two chains same in all the way. 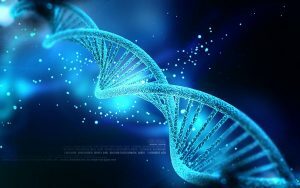 DNA is a complex organic molecule that carries the genetic information of growth, development and reproduction of all living organisms. The repeated unit of sugar and phosphate group is the backbone of DNA. 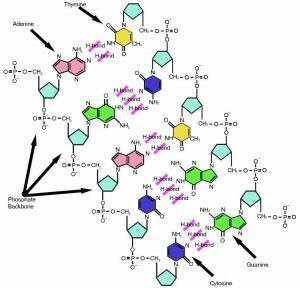 Nitrogen base is the most important part of DNA chain because the order of their sequence determines the DNA’s instruction or genetic code. Two DNA chains joined together with hydrogen bond.